The following interview was done by Perla Hajj, a member of the Young Peace Journalists. It is the latest entry in the Young Peace Journalists project featuring the stories and voices of refugees. It is translated from Arabic into English. We live in a world that is constantly moving. The Middle East today is facing a big crisis, whether it is in Yemen, Bahrain, Iraq or Syria. Those countries are being shaped by this huge instability and everything’s changing. In 2011, a new war started in the Middle East. This war is taking place in Syria. Today we’re in 2017 and the war is still there. Is it possible to imagine the damage that has been caused by this indescribable war? I’m not even talking about the material damage but the psychological. Is it even countable? In this interview, I would like to highlight this point and share with you an interview I conducted with a young Syrian girl. A girl who should be like any other girl of her age but is not. Her name is Layla. Layla is only 18 years old, but she is much more mature than her age. This interview has been conducted in the light of prejudices against Syrian refugees. It emphasises the identity crisis refugees are facing. The integration process, the adaptation of a new culture, in a new country … this takes time — a lot of time. In this interview, Layla confides in me her thoughts and fears about the prejudices towards and rejections of Syrians. “My name is Layla. I’m 18 years old and I come from Aleppo, Syria. I’m currently living in Lebanon. Layla seemed ill at ease. 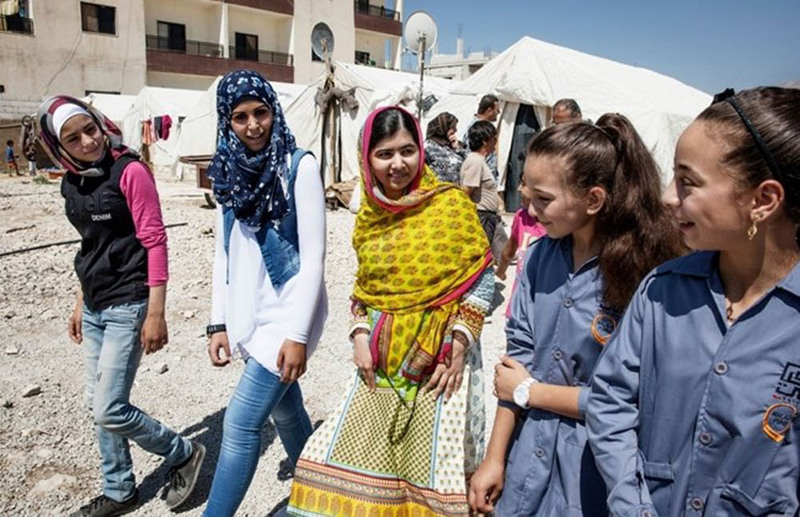 Malala walks through Syrian refugee camp in Lebanon with other young women. “His sentence literally breaks my heart. “Whenever I hear bad things about Syria or Syrians … it makes me so sad. Maybe it’s because I am young and thus vulnerable, but it truly affects me. “I have mixed feelings: a part of me wants to hide, ignoring what the others think or say. While, at the same time, a part of me doesn’t want to hide anymore and wants to change this connotation and misunderstanding. “I am 18 years old today but I feel as if I’m at least 40 or even 50 … I feel old in my head, in my body, in my way of thinking. I’m afraid, afraid of the present, of the future. I think that I wasn’t prepared for this … for all of this. It’s … It is too much. At one point, she burst into tears. She wrenched her thoughts back to the present. She took a moment to wipe her tears, and then, she started to open herself to me and share with me the deepest thoughts she encountered. Her voice quavered a moment. “For a while, I was ashamed of my origins. I know that I should not say that, but it’s important. I reckon that I was young (and still am, even though I don’t have this feeling anymore), but the truth is that I didn’t understand, I wasn’t aware of the situation. Today I feel a bit more mature. “In a way I think that I lost my innocence. This sentence may sound sad, but it’s not. I’m happy I have become like that. “For the last couple of years, I was angry at the world, angry at the international community, at all these supposedly big countries that promote human rights because they let all the bad things happen in my country. Eleanor Roosevelt once said, “No one can make you feel inferior without your consent.” And this young girl understood it while facing this situation. Her warm, brown eyes lit with hope. Perla Hajj is a young woman from Lebanon. She holds a Bachelor’s Degree in Political Science and is currently pursuing a double degree Master in Management between Paris and Beirut. Perla was an intern at Pax Christi International during autumn 2015 where she assisted the communications department. She believes that this project enables all of us to be a voice for those who don’t or can’t speak.